THE thought of having beef for dinner is enough to kickstart my appetite, whether it is beef rendang, stewed beef or simply a plate of beef noodles from a stall in Jalan Imbi. So how can I resist better quality beef like the Wagyu Beef and the Master Kobe when this chance came by. We were the first to arrive at Doubletree by Hilton, but it took us some time trying to find the restaurant which was located on the 10th floor of the hotel, next to the pool. 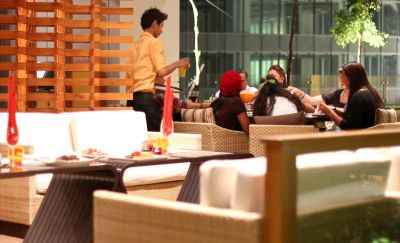 Tosca is an Italian Trattoria primarily serving home-style Italian cuisine with both an indoor and an outdoor seating. We were ushered to a covered area at the outlet as it was raining that evening and while waiting for the rest to arrive, a bowl filled with different kinds of bread greeted us. Shortly after, its executive sous chef Chef Eric Siew dished out three of his seven specialities for Tosca’s Premium Wagyu and Master Kobe promotion for the review. Each portion served to us had been reduced from its original serving as he wanted us to have a go at the different selection on the menu. 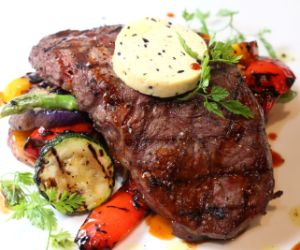 Premium dish: Grilled Master Kobe Flat Iron Steak served with a generous amount of smoked truffle butter, sauteed potatoes and balsamic grilled vegetables. We started off with the Roasted Wagyu Thick Skirt (RM120), which was also everyone’s favourite for the evening. The dish was light and had a good combination when matched with a small portion of cracked wheat panzanella, which looked like couscous, and is served together with grilled new potatoes with salsa verde. He said the sauce was prepared from beef stock that had gone through a five-hour reduction while the salsa verde came from a combination of parsley, basil, garlic and pickles which complements the cracked wheat beautifully. Our next dish was the hamburger made with Grilled Master Kobe Steak (RM99) served with Roma tomatoes, fried onions, mustard relish and homemade potato chips all stuffed in a Parmesan ciabatta bread. “Although most beef burgers you see uses minced beef but for me it will be a waste if I mince the steak for the dish,” said Siew who twisted his cooking styles to preserve the quality of the meat. 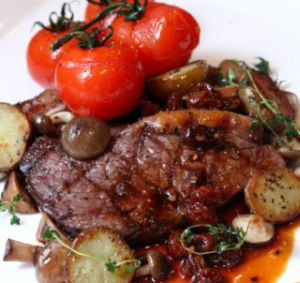 Delectable: Grilled Wagyu Rump Steak with sauteed mushrooms, roasted baby tomatoes,cocktail potatoes, Armagnac and topped with epper – raisin sauce. Below: Grilled WagyuSirloin with glazed vegetables, seared polenta cake, caramelised onions and Barolo wine sauce. We moved on quickly to the next with the Grilled Master Kobe Flat Iron Steak (RM120), which was already too much for some of us as we struggled to finish it. What we loved was the large portion of the truffle butter which Chew placed on top of the beef. This was served with sautéed potatoes and balsamic grilled vegetables. The remaining four other dishes on the promotion is the Grilled Wagyu Sirloin served with glazed vegetables, seared polenta cake, caramelised onions topped with Barolo wine sauce (RM180), Grilled Wagyu Rump Steak with sauteed mushrooms, roasted baby tomatoes, cocktail potatoes, Armagnac and pepper-raisin sauce (RM135), Seared Pepper Crusted Master Kobe Beef Carpaccio with mustard dressing, rocket salad, Parmesan cheese, pine nuts and lemon oil (RM80) and the Grilled Master Kobe Chuck Tail Flat, Milanese style risotto cake, summer vegetables and spicy Sicilian tomato salsa (RM145). Siew, who was previously attached with Macau’s MGM Grand, said the Australian Wagyu chosen for his dishes came with a score six while the Australian Master Kobe holds a score of 10. The Europe-trained Siew said the weight for the beef in each dish varies between 180g and 200g. “We have to see what accompanies the dish, the burger for instance comes with bread and side dishes so we can’t put 200g beef there as it will make the burger heavy,” said Chew. Our evening ended with Tosca’s very own Italian Sundae; the Coppa Gelato di Tosca and warm cup of Latte. The promotion is available for both lunch and dinner. It ends on May 22.